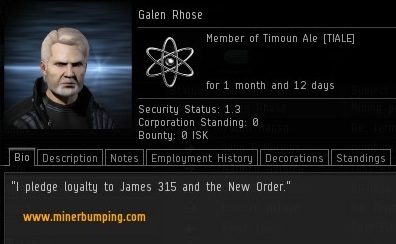 With all of the explosions and bot-aspirancy in highsec, we sometimes forget about the good things that go on in that area of the EVE galaxy. 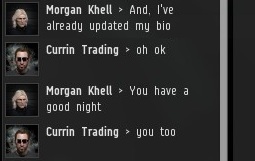 While I was FC'ing a death sentence against an unlicensed miner, I received a convo from a gentleman miner. He politely waited for me to finish correcting the Code violator. One of our scouts reported another target, and I forgot about the convo for the better part of an hour. 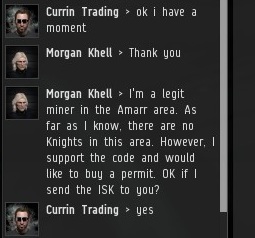 It's always OK to send isk to me. As a courtesy, I always remind people who purchase mining permits that they need to pledge loyalty to me in their bio. ...But he was way ahead of me. 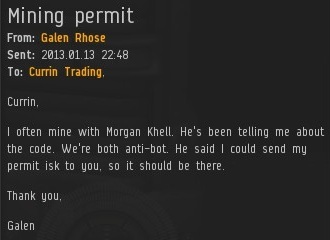 Another permit sold, and highsec was one step closer to perfection. Then I received an EVEmail from one of his friends. I do not use the word "friend" lightly. Some people are business partners, colleagues, acquaintances, or temporary allies. A miner who tells another miner to get right with the Code is a true friend. Though rife with bot-aspirancy, greed, and carebearism, highsec is also a place where the spirit of love and friendship is beginning to grow. The Amarr area has no Knights or Agents in the area? Interesting. I'll get a hold of the miners and see what the area is like. Yea I used to frequent the Amarr area (Sent James a mail awhile back about it) but have since moved down to Gallente space and have been playing in low and null as of late (I still try to wave when I go through Code Enforced systems). I was there last night in Gosalav. It was over run with bots. I bumped for hours on one whole corporation of them. They never made any response in local or action. After I would bump them out of range they just returned to their orbits and circled pointlessly with no lasers on. Then they would all warp to station, warp back and start mining again. I bumped them out and we did it all over. Several times. Even with my new "blast the target with fireworks as I bump" technique they never flinched. I DID collect three permit payments from nearby at keyboard miners who had apparently never seen an Agent at work and a loud, angry (and long) chastisement from a refugee from Kamio. I'm going back tonight for more fun, err, proper enforcement of The Code. One other thing of interest. The bot corp was Budddl's Sippe. This is the corp of GalaxyDeath who the Knights killed in Brapellile on 26 Dec 2012. They got her ship and her 1.4 billion ISK pod. So the corp ran to Amarr space where they were, until now, safe from the New Order. For hate's sake, I spit my last breath at thee. Blog by Lorinda Wise Williams, former guidance matchmakers technician teaching character education for the Cajon Valley Union School District. Click on worksheets..., copy and paste.